Arabia Mountain High twins return to former middle school to help young writers. 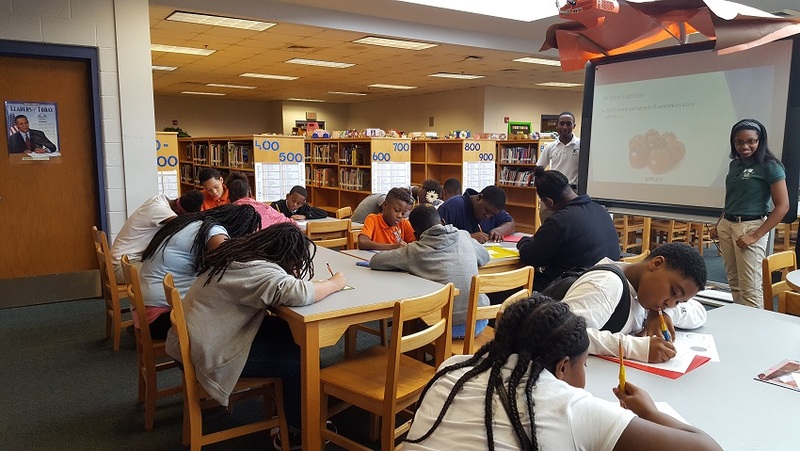 The Trice twins volunteer to teach expository writing skills to 6th grade students at Columbia MS.
Kailah and Artis Trice, a twin brother and sister at Arabia Mountain High School, were once developing writers in middle school. That experience and insight has led them back to Columbia Middle School to help their younger peers. Each Friday morning, the Trice twins volunteer their services and time to teach expository writing skills to sixth-grade students at Columbia Middle School. In collaboration with Leora Senior, Columbia Middle School teacher and librarian, the student duo has committed to helping boys and girls at their former middle school become better writers. The support reinforces the classroom instruction of teachers Victor McBride and Tejaeda Beasley. The twins have used ingenuity to incentivize young students to practice both their oral and written communication skills. Both teachers have remarked how this volunteer effort has increased students’ confidence in their ability to express their own thoughts. While volunteering, Kaliah and Artis also work hard on their own studies. Artis was recently accepted to Kennesaw State University, and Kailah will be attending the University of Georgia next fall.